Home » Around NYC » Where is Ben Kallos? It's June 17th, Roosevelt Island Day. A drenching rain is falling, sending vendors scurrying for cover, when our bus stops in front of Good Shepherd Plaza. Ben Kallos, his suit soaked, steps on the bus. Kallos, as we've learned, doesn't miss many events here. You might see him at the CBN/RI Senior Center, helping launch a new program, or leaning in with the CERT Team at the Easter Egg Hunt. He's gotten to know us, not by sending our surrogates, but by showing up, even when it means risking having one of is best suits soaked with rain. Elected to replace popular incumbent Jessica Lappin when term limits forced her from office, Ben Kallos took office as New York City Council Member for a district including Roosevelt Island in 2014. Nearly two and a half years later, where is Ben Kallos? The answer: nearly everywhere. 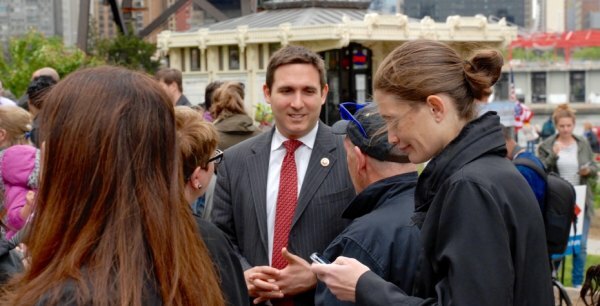 Before his first day on the job, Ben Kallos was already a whirlwind of activity. Having established himself in public service while Policy Director for Public Advocate Mark Green, Kallos's energy electrified a dedicated team of supporters working to earn him his first elected office. Covering Cornell Tech's ULURP activity for the Main Street WIRE, I saw them show up at meetings to assert Kallos's commitment to the community when his opponent was almost always absent. Underdog in a primary contest with Micah Kellner, well-known as a State Assembly Member, and Ed Hartzog, Kallos prevailed by a comfortable margin, then went on to defeat David Paul Garland and, again, Kellner in the general election. 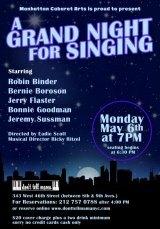 Roosevelt Islanders who regretted the loss of Jessica Lappin were soon reassured that our new Council Member would not be a letdown. Although he represents the moneyed neighborhoods of the Upper East Side as well, Kallos has not been a stranger to low profile Roosevelt Island. Earlier this year, he backed his support of green initiatives by handing out free cloth bags to replace disposables used at markets. He put real muscle into Participatory Budgeting that brought $1 million in funding for the Green Roofs initiative at PS/IS 217. While other elected sent best wishes, Kallos showed up in person for both the unveiling of the child sculpture Blue Dragon and the Tram's 40th Anniversary celebration. What more recently caught my attention was seeing two stories in the New York Times relying on Kallos for his insights on a pair of critical issues before the Common Council. “The city should not be providing public dollars to amplify the already strong voices of special interests,” he told the Times when asked about a bill that would curb the power of lobbyist, a bill on which his majority leader Melissa Mark-Viverito was sitting to keep it from going anywhere soon. And before that got cold, as Chairman of the City Council Committee on Government Operations, Kallos's position on the di Blasio administration's controversial handling of deed restrictions, especially those resulting in huge developer profits for Rivington House, had to be considered. This time in concurrence with Mark-Viverito, he told the Times, “The Council has a responsibility to hold an oversight hearing." Even from a distant vantage point in the Aegean Islands of Greece, where I was on a media assignment, that was impressive. Just two years in office and Ben Kallos is leaving a trail that glues him in the consciousness of his constituents. Always there when we hope he will be. Then, even more, on the broader city stage. Watch Ben Kallos. It shouldn't be hard. He's everywhere.